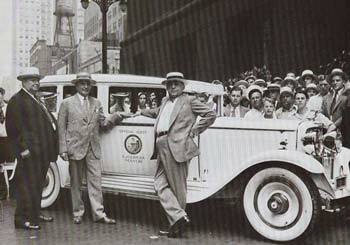 My own shirttail relative: the late Mayor Anton J. Cermak (third from the left). The idiom shirttail relative, rarely heard nowadays, refers to someone who is distantly related and often forgotten. Another idiomatic use of shirttail, cited by the online Free Dictionary, describes the adjectival use of the word as denoting something “of little value; inadequate or small.” Here I’m guessing that the above definition emerged from a common opinion that this part of a shirt’s structure was considered plain and inconsequential; after all, once a shirt is worn and tucked in, the wearer cannot even see his or her shirttail and may soon give little thought of it. Which, when you think of it, is a way of describing long-lost-from-memory relatives. Mayor Anton Cermak, right, acted by veteran character actor Robert Middleton, and legendary G-man Eliot Ness, left, played by Robert Stack (Airplane!) in The Unhired Assassin, Season 1, Episode 20 and 21 of the TV series The Untouchables. It’s not every day that a relative, distant or not, like my “uncle”Anton Cermak, is portrayed in a hit TV show. But that was the case back in February 25, 1960, in The Untouchables, a TV gangster series set in the 1930s. Anton Cermak, was a considerably distant cousin of my grandfather Otto. Cermak served as the 34th mayor of Chicago, Illinois, from April 7, 1931 until his death on March 6, 1933, dying from complications arising from a failed assassination attempt on the life of then President-elect Franklin D. Roosevelt. As I learned at both my father’s and his father’s knees, Cermak was a master of big city machine politics, and was considered a fairly decent mayor, at least by Chi-town standards. But what really canonized Cermak for America’s entire Bohemian community, including my family, was the widely held belief that he died a bona fide hero for taking a bullet meant for FDR. 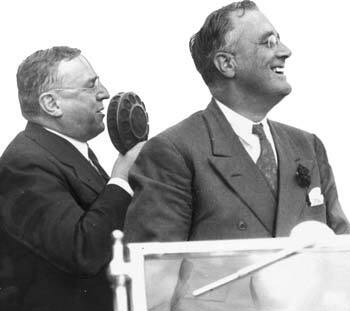 FDR, right, with my revered, many-times-removed “Uncle” Cermak. Requiescat in pace, Mr. Mayor. Now that’s some shirttail relative. This entry was posted on Friday, October 13th, 2017 at 3:12 pmand is filed under . You can follow any responses to this entry through the RSS 2.0 feed. You can leave a response, or trackback from your own site.